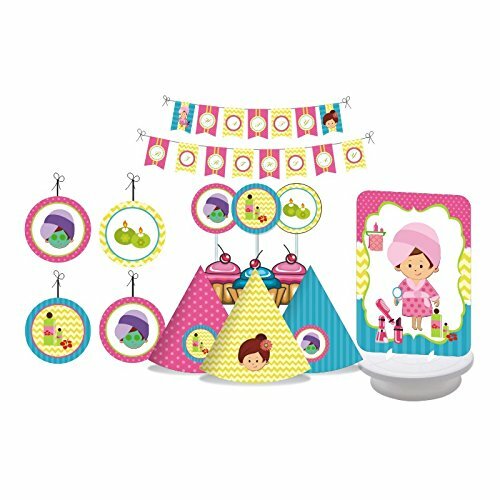 Decorate your little one's party with this lovely Spa themed decorating kit. The package includes 12 Party Hats (Flat), 2 Centerpieces, 1 Bunting Banner, 6 Danglers and 6 Cupcake Toppers. 12 Party Hats; party hats come flat packed and need to be folded. 1 Happy Birthday Bunting Banner. The banner comes as 2 banners one as "Happy" and the other as "Birthday". It can also be used together as one long banner. Each letter flag is 4" x 6". The "Happy" is 28" long with 2 spacers and extra ribbons to make it as long as 32". The "Birthday" is 32" long with extra ribbons to make it as long as 35". If you have any questions about this product by W&N Distribution, contact us by completing and submitting the form below. If you are looking for a specif part number, please include it with your message.